Lunch at St Joseph’s takes place between 12.00 pm and 1.00 pm. Caterlink, our catering contractor, uses high quality, fresh local food which is then cooked in the kitchen by our own school chef, Sam. All Islington students are entitled to free school meals. Your child will be cared for by the midday supervisors both in the dining area and the playground. If your child has a specific allergy or dietary requirement, please let us know by emailing the school at office@st-josephs.islington.sch.uk. Of course, children are also welcome to bring a packed lunch if they prefer. We are a nut free school, so please ensure that there are no products with nuts in your child’s lunch. Please use a lunchbox or cool bag that is clearly labelled with your child’s name and make sure drinks are in leak proof plastic bottles (no glass please!). 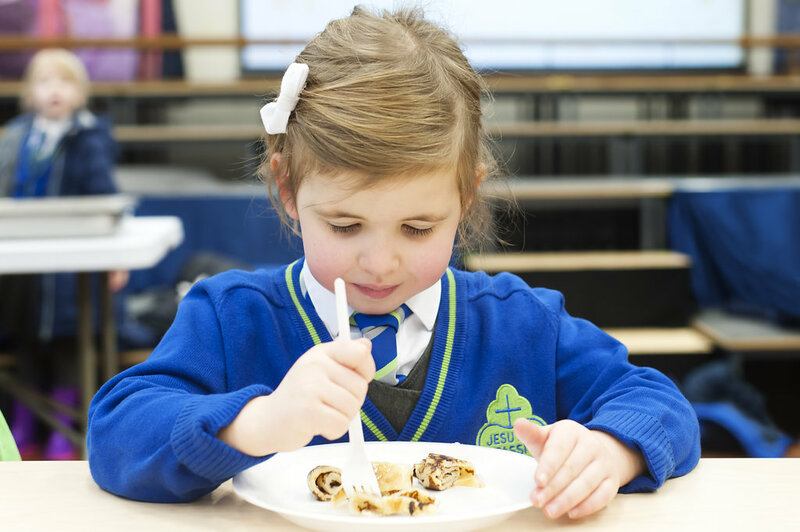 At St Joseph’s, we believe that our children need to eat well in order to grow, develop and be healthy and active. We know that a healthy, enjoyable lunch gives children the energy and nutrients they need to learn and play at school. This is why we have designed our very own ‘Healthier Packed Lunches for Children’ leaflet. It provides information on how to pack a healthier lunch and follows the government’s packed lunch guidelines. Islington is one of the few councils in England to offer free school meals for all nursery and primary pupils, but we need our parents to register their child for Islington’s Free School Meals grant. Please register here for Islington’s Free School Meals Grant. Registering could raise an extra £1,320 per child for St. Joseph’s Primary School from central government to fund valuable support like extra tuition, learning assistants or after school clubs. If you do not register, St. Joseph’s may not receive this extra funding from Islington Council. It would be beneficial to the school if parents who choose not to take up the opportunity of a Free Meal and would like to remain on packed lunches still complete the form.